Clevite, an IAS client of 11 years, was acquired by MAHLE GmBH and needed to have the new MAHLE corporate design applied to its site while maintaining its customer mission. IAS applied the new MAHLE corporate web design efficiently due to previously implemented site restructuring while preserving & integrating all of the previously developed web application functionality including: customer/sales extranet, full CRM, publications ordering & dealer locator. 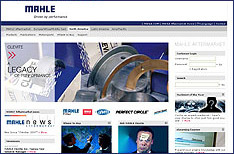 With IAS' easy to use web content engine, the MAHLE Clevite family of Web sites are able to share selected common dynamic content sections and incorporate a unique design "skin" for each without having to create an entirely separate Web site. This highly efficient process saves the MAHLE Clevite group time in deployment, development and ongoing site maintenance. The IAS dynamic content management technology allows MAHLE Clevite to effectively reach its respective geographic and product markets which include MAHLE Clevite CA, (CA customer site) Engine Parts One & CARQUEST Gaskets CA , MAHLE Clevite US, MAHLE Clevite MX, CARQUEST Gaskets US and the motorsports enthusiast sites MotorHeadHeaven.com and Gearhead Gab. MAHLE GmBH is one of the world's largest suppliers of components, modules, and systems to global vehicle manufacturers and related aftermarkets. The company's Clevite Parts division, a wholesale automotive aftermarket supplier, continually works with IAS web application development and design staff to provide their customers with an improved website offering more convenient access to tools, technical support, and product information to help them stay competitive. IAS works closely with Clevite to develop the company's popular Motorhead Heaven site providing a "sanctuary for motorsports enthusiasts & gearheads" offering the latest information about engine parts, racing technical tips, and other subjects of interest to Clevite customers. Other features offering added value to the MAHLE Clevite group website include online catalog and product selection guides, technical tips, product data sheets, installation information, and improved design and navigation. Additional client support services include managed ASP host for database services, customer & sales extranet and dealer locator. "We're very happy with the new website IAS developed for us. It's intuitive to use, looks great, and is exactly what we needed. We especially like IAS's project turnaround time and their overall response for content management updates. Their staff is knowledgeable and helpful and all of our subsequent content and feature additions to the site have performed very well."